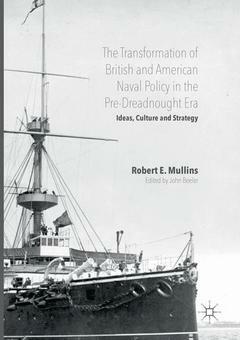 This volume examines the transformation of British and US naval policy from 1870 to 1889, which resulted in the British Naval Defence Act (1889), the construction of the first modern US battleships, and began the naval arms race which culminated in World War One. In examining the development of strategic thinking in the Royal and US Navies, it overturns conventional wisdom regarding genesis of the Naval Defence Act and the US Navy?s about-face from a defensive to an offensive strategic orientation. It pays particular attention to activities of the key individuals in both countries? navies, who were instrumental in transforming their respective services? organizational culture. This study will be of interest not only to historians but to political scientists, sociologists, and others working in the fields of international relations, strategic studies, policy analysis, and military learning, adaptation and innovation. It is also essential reading for those interested in the naval arms race during this period. Editor’s introduction.- PART I: OVERVIEW.- 1. Introduction.- 2. Explaining strategic choices in military institutions: theoretical models.- PART II: THE STRUGGLE FOR CONTROL OF BRITISH NAVAL POLICY, 1870-1889.- 3. The royal navy and the 1889 naval defence act: history and historiography.- 4. Ideas and institutions: the development of officer education, strategic thinking, and intelligence collection in the royal navy, 1870-1888.- 5. Professionals, politicians, the press, and the public: the “navy scare” of 1888-1889.- PART III: STRATEGIC RECONFIGURATION IN THE UNITED STATES, 1873-1889.- 6. British ideas in an American context: the underpinnings of strategic debate and organizational maturity, 1873-1884.- 7. The navalist triumph: politicians, professionals, and the fight for the direction of American naval policy, 1885-1889.- PART IV.- 8. Conclusion. Robert E. Mullins, previously a Researcher in War Studies at King’s College, University of London, UK, is currently Executive Vice President for Corporate Strategy and Mergers & Acquisitions at Cobham plc, UK. John Beeler is Professor of History at the University of Alabama, USA, where he has worked since 1993. His publications include British Naval Policy in the Gladstone-Disraeli Era, 1860-1880 (1997); Imperial Defence, 1868-1887 (2014); The Birth of the Battleship: British Capital Ship Design, 1870-1881 (2001), and The Milne Papers, Volumes 1 and 2 (2004, 2015).